Armenian mythology originated in ancient Indo-European and Urartian traditions, gradually incorporating Mesopotamian, Iranian, and Greek ideas and deities. There are signs that the ancient Armenians were initially nature worshipers and in time came to worship national gods, many adopted from neighboring cultures. Side view of the Garni Temple. The pantheon of Armenian gods (ditsov) formed during the nucleation of the Proto-Armenian tribes which inherited the essential elements of paganism from the Proto-Indo-Europeans of the Armenian Plateau. Historians distinguish a significant body of Indo-European language used by Armenian pagans as sacred. The oldest cult worshiped an unfathomable higher power or intelligence called Ara, embodied as the sun (Arev); the ancient Armenians called themselves "children of the sun". Also among the most ancient types of Indo-European-derived worship are the cults of eagles and lions, and of the sky. Over time, new deities of Armenian and not Aryan origins appeared. Furthermore, the supreme god of the Armenian pantheon, Vanatur, was later replaced by Aramazd. Aramazd was the Parthian form of Ahura Mazda. The latter, though, has appeared under the influence of Zoroastrianism (see Ahura Mazda), but with partially preserved traditional Armenian features. Similarly, the traditional Armenian goddess of fertility, Nar, was replaced by Anahit. Zoroastrianism had a major influence on the Armenians and their mythology. Until the late Parthian period, the Armenian lands doubtless adhered predominantly to Zoroastrianism. In the Hellenistic age (3rd to 1st centuries BC), ancient Armenian deities identified with the ancient Greek deities: Aramazd with Zeus, Anahit with Artemis, Vahagn with Hercules, Astghik with Aphrodite, Nane with Athena, Mihr with Hephaestus, Tir with Apollo. After the formal adoption of Christianity in Armenia, new mythological images and stories were born as ancient myths and beliefs transformed. Biblical characters took over the functions of the archaic gods and spirits. For example, John the Baptist inherited certain features of Vahagn and Tyre, and the archangel Gabriel that of Vahagn. Basic information about Armenian pagan traditions were preserved in the works of ancient Greek authors such as Plato, Herodotus, Xenophon and Strabo, Byzantine scholar Procopius of Caesarea, as well as medieval Armenian writers such as Moses of Chorene, Agathangelos, Yeznik of Kolb, Sebeos and Anania Shirakatsi, not to mention oral folk traditions. Modern depiction of Vahagn the dragon slayer. The pantheon of pre-Christian Armenia changed over the centuries. Originally Urartian in nature, the pantheon was modified through Semitic, Iranian, then Greek influences. Ḫaldi or Khaldi - Chief of the pantheon in its earliest stages. Due to his name becoming a title akin to Baal (i.e. "the Khaldi/Baal of the city", "the Khaldi/Baal of storms"), the chief deity was eventually syncretized or replaced with Ahura Mazda, becoming Aramazd (see below). Formed a triad with his sons Ardinis and Teisheba. Teispas or Teisheba - Storm god, a son of Ḫaldi, with whom he formed the lead triad of the gods. Shivini or Artinis - Sun god, a son of Ḫaldi, with whom he formed the lead triad of the gods. Selardi - Consort of the Moon god. Saris - Probably a corruption of Ishtar. Zoroastrian influences penetrated Armenian culture during the Achaemenid Empire, though conversion was incomplete and syncretistic, and the Persians and Armenians never appeared to identify with each other as co-religionists despite both referring to themselves as "Mazda worshipers." Aramazd - Cognate of the Iranian Ahura Mazda (or Ormazd). Head of the pantheon, identified with Zeus in the interpretatio graeca, with whom he shared many titles. Sometimes worshiped under the title Vanatur ("Lord of the Van"), particularly during new year's celebrations. Along with Anahit and Vahagn formed a lead triad. In time, the positive functions of Baal Shamin were absorbed by Aramazd. Anadatus - The Armenian form of the Zoroastrian Amesha Spenta Ameretat. Anahit - Cognate of the Iranian Anahita. The goddess of fertility and birth, and daughter or wife of Aramazd, Anahit is identified with Artemis and Aphrodite. Temples dedicated to Anahit were established in Armavir, Artashat, Ashtishat. Mihr - Cognate with the Iranian Mithra. God of the sun and light, son of Aramazd, the brother of Anahit and Nane. Historically, despite his high place in the pantheon, worship of Mihr was eclipsed by Vahagn (indeed, Mihr's worship appears to have been supplementary to Vahagn's), and little is known about his worship aside from similarities to the Iranian Mithra and the absence of the Mithraic mysteries. Mihr was identified with Hephaestus by Movses Khorenatsi and later authors. His center of worship was located in Bagaharich, and the temple of Garni was dedicated to him. Omanos - The Armenian form of the Zoroastrian Vohu Manah. Spandaramet - Cognate of the Iranian Spenta Armaiti, a daughter of Aramazd, and cthonic goddess of fertility, vineyards and the underworld. Spandaramet was chosen by translators of some Armenian Bibles to convey the meaning of Διόνυσος) in 2 Maccabees 6:7. Sometimes called Sandaramet or Santamaret denoting a connection to the underworld unique to Armenian theology, even in Christian writings. Her kingdom is said to be inhabited by evil spirits called Santarametakans. Tir or Tiur - Cognate to either the Iranian Tir (or Tishtrya) or (via Armenian dpir "scribe") the Babylonian Nabu. In either case, the mercurial god of wisdom, written language, culture, and science; messenger of the gods and psychopomp. Identified with the Greek Apollo. Tir's role as psychopomp may have been absorbed from the Luwian thunder god Tarhunda, whose name had been used to translate that of the Mesopotamian underworld god Nergal. Tir's temple was located near Artashat. Tsovinar - Fierce goddess of the sea and storms, consort of Vahagn. Vahagn - Cognate of the Iranian Verethragna (via Vahram -> Vram -> Vam + -agn). The storm god and dragon slayer, identified with the Greek Hercules, this identification going full circle when Armenian translators of the Bible used Vahagn to translate Ἡρακλῆς in 2 Maccabees 4:19. Sometimes referred to by the title Dsovean, particularly in his role as a god of the seas. Vahagn adopted some features of the Hurrian storm god Teshub, through the Urartian Teisheba and after. Christian folklore absorbed Vahang's role as a storm or weather god into the archangel Gabriel. Derik housed the central temple to Vahagn. Astghik - Cognate of the Semitic Ishtar, identified with Venus. A fertility goddess and consort of Vahagn, sharing a temple with him in the city of Yashtishat. The holiday of Vardavar was originally in honor of Astghik. Barsamin - God of sky and weather, derived from the Semitic god Baal Shamin. Nane - Cognate of the Elamitic Nanē, (via the Babylonian Nanâ), also assimilating aspects of the Phrygian Cybele. Daughter of Aramazd, war and motherhood goddess. Identified with Athena. Her cult was related to Anahit, both of their temples located near each other in Gavar. Al - The Al is a dwarfish evil spirit that attacks pregnant women and steals newborn babies. Described as half-animal and half-man, its teeth are of iron and nails of brass or copper. It usually wears a pointed hat covered in bells, and can become invisible. 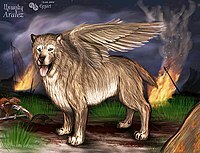 Aralez - Aralezner - The oldest gods in the Armenian pantheon, Aralez are dog-like creatures with powers to resuscitate fallen warriors and resurrect the dead by licking wounds clean. Devs - The Dev are air-composed spirit creatures originating from Zoroastrian mythology (the Daevas), and share many similarities to angels. They reside in stony places and ruins, and usually kept to themselves. Shahapet - The Shahapet (Սհահապետ), also called Khshathrapti, Shavod, Shoithrapaiti, Shvaz and Shvod, were usually friendly guardian spirits of Armenian, Slavic and Persian mythology, who typically appeared in the form of serpents. They inhabited houses, orchards, fields, forests and graveyards, among other places. The Shvaz type was more agriculturally oriented, while the Shvod was a guardian of the home. A Shvod who is well-treated may reward the home's inhabitants with gold, but if mistreated might cause strife and leave. Nhang - The Nhang (from the Persian word for "crocodile") was a river-dwelling serpent-monster with shape shifting powers, often connected to the more conventional Armenian dragons. The creature could change into a seal or lure a man by transforming into a woman, then drag in and drown the victim to drink its blood. The word "Nhang" is sometimes used as a generic term for a sea-monster in ancient Armenian literature. Piatek - The Piatek is a large mammalian creature similar to a wingless griffin. Vishap - A dragon closely associated with water, similar to the Leviathan. It is usually depicted as a winged snake or with a combination of elements from different animals. Shamiram stares at the corpse of Ara the Beautiful (painting by Vardges Sureniants, 1899). These figures are mainly known through post-Christian sources, but may have belonged to the pre-Christian mythology. Ara the Beautiful - A handsome warrior slain in a war against Semiramis, in some versions brought back to life by her prayers. Aram - Slayer of the giant Barsamin, possibly originally a war god known as Aremenius. Hayk or Haik - Legendary forefather of the Armenian people, who led a successful rebellion against a Babylonian king named Bel. When Bel and his armies pursued Hayk and his people, Hayk fired an arrow across the battle field, killing Bel and scaring off his forces. Ervaz and Yervant - Mythical twins born from a woman of the Arsacid Dynasty of Armenia, distinguished by enormous features and over-sensitivity. Karapet - a pre-Christian Armenian mythological character identified with John the Baptist after the adoption of Christianity by the Armenians. Karapet is usually represented as a glittering long-haired thunder-god with a purple crown and a cross. Nimrod - Great-grandson of Noah and the king of Shinar, Nimrod is depicted in the Bible as both a man of power in the earth and a mighty hunter. Sanasar and Baghdasar - Two brothers founded the town of Sassoon, ushering in the eponymous state. Sanasar was considered the ancestor of several generations of heroes of Sassoon. Sarkis - A hero, associated with pre-Christian myths, later identified with Christian saints who bore the same name. He is represented as a tall, slender, handsome knight mounted upon a white horse. Sarkis is able to raise the wind, storms and blizzards, and turn them against enemies. Shamiram - The legendary Assyrian queen who waged war to get Ara. ^ a b c d e f g h i Russell, James R. (15 December 1986). "ARMENIA AND IRAN iii. Armenian Religion". Encyclopædia Iranica. Retrieved 3 July 2014. ^ Boettiger, Louis Angelo (1918). Armenian Legends and Festivals. University of Minnesota. ^ Coulter, Charles Russell. Turner, Patricia. "Encyclopedia of Ancient Deities" McFarland & Co., Routledge, 2012; pg. 438. ^ Herouni, Paris (2004). Armenians and Old Armenia. Yerevan. p. 8, 133. This page was last edited on 4 April 2019, at 05:26 (UTC).